If you’ve been to the Unbounce HQ office in Vancouver, you may have noticed the blue and orange mural in our reception area. It’s a cleverly designed panorama of Vancouver integrating our company’s six core values. The values listed on the wall are more than colourful jargon, they guide our conduct with our customers, one another and our community. The actual making of the mural is one of the best examples of Unbounce’s culture in action. Created by our designers, it was projected as an outline on the wall, and then our entire team used markers to fill in a small section at a time. Each etch on the wall works together in the same way each action we take individually or collectively lives out the values of humility, transparency, generosity, delight, empowerment and courage. Over the past few years, we’ve made it no secret that Unbounce’s objective is to become the best technology company to work for. We love to share snippets of our culture on social media, and have outlined the numerous benefits of working here, but we’ve yet to share publically all the ways Unbouncers are empowered and encouraged to give back to the community. Last year, our senior leadership team launched a charity matching program to support and amplify individual fundraising efforts. In 2016, our matched donations totaled $7,500 for organizations such as Red Cross’ Disaster Relief Fund, Movember, Women Against Violence Against Women and Pixel Paws. Even our satellite offices in Montréal and Berlin took part in these fundraising campaigns. On top of having their funds matched, employees gain increased exposure for their charities of choice through the use of our our strong social channels, marketing expertise and design knowledge. Plus, our events space serves as a great place to host in-person fundraising events. A dedicated community engagement role was also established in early 2016 to manage our charity initiatives and further Unbounce’s engagement within its local communities. The role works to further the founders’ commitment to making a measurable impact with our collective resources of product, people and proceeds. Their commitment, it seems, is well recognized within the company. Earlier this year, a company-wide survey revealed 84% of respondents agree or strongly agree that Unbounce is committed to social responsibility (e.g., community support, charitable giving, etc.). Beyond the internal charity matching program, Unbounce offers significant discounts (40% and 20% off our product) to over 250 charities and non-profits. Via our multi-channel customer support, representatives get help building and optimizing their landing pages. We also offer them the opportunity to attend our CTA Conference at a discounted rate. Our community involvement also extends to supporting educational institutions, incubators and accelerators. Within the last year, our executives and team members have been involved in over 25 roundtable discussions, presentations and office tours for BCIT, UBC, SFU, Emily Carr, Red Academy, Launch Academy, Lighthouse Labs, Youth Entrepreneur Launch Leadership Program, SpringU and GradusOne. In 2016 we hosted over 50 events for students and job seekers and participated in recruitment fairs and hackathons. Unbounce recognizes that supporting students and educators is a long-term investment in the future generation of skilled tech workers. This investment today will create a strong and vibrant industry tomorrow. In October 2016, Unbounce became the technology sponsor for the first ever STEM (Science Technology Engineering Math) Spotlight Awards, which provides opportunities for problem-solvers ages 18 to 24 interested in jobs in STEM sectors. In its inaugural year, the contest emphasized the next generation of careers in the tech industry. A team at Unbounce — including our CTO, Director of Technology, Senior Conversion Optimizer and Content Director — asked contest participants to imagine a delightful future of marketing with machine learning and AI at it’s core. 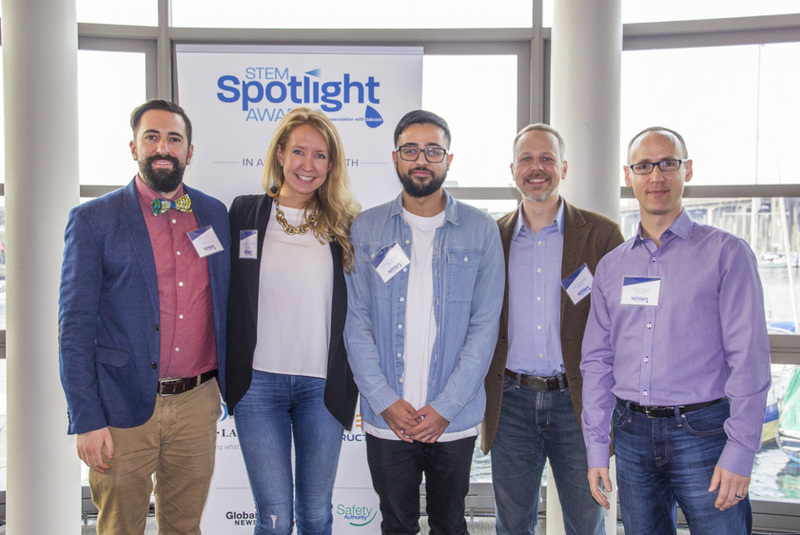 Unbounce Team with STEM Spotlight technology category winner Naheel Jawaid (from left to right Dan Levy, Sarah Gooding, Naheel Jawaid, Carl Schmidt and Tavis Rudd). Over the past year Unbounce has grown by 70 employees while still preserving its culture of warmth and generosity. With the increased headcount comes the opportunity for us to further grow our impact within the community. That means more volunteer hours, more shared expertise and more funds allocated to our employees as they campaign for charities that are close to their hearts. With an increase in talent, we’ve also been able to release new product features and updates, which have contributed significantly to customer retention and growth. This increase in revenue has allowed us to up the amount we’re able to put directly back into the community through sponsorship. The Unbounce team is living out our core values daily, from the courage, humility and transparency it takes to address our diversity issues, to empowering our employees and generously matching their fundraising efforts, to our commitment to customer and community delight via top-quality support, fantastic local events and our CTA conference. Unbounce is creating and sustaining a vibrant tech community within the province of British Columbia… and we’re just getting started.